NCMA is finalizing the agenda for the International Concrete Exposition: Machinery & Equipment Show, whose inaugural staging is set for February 9-10 at the Indiana Convention Center in Indianapolis. True to the ICON Expo 2018 theme, the small-scale exhibit component built into event’s schedule since 2015 will be replaced by a larger trade show, complete with plant components and machinery—and 16 hours of booth time between Friday and Saturday. ICON Expo 2018 will be held in conjunction with NCMA Annual Convention, February 6-8, and the Interlocking Concrete Pavement Institute’s Annual Meeting, February 11-14. Keynote speaker. Recently named to lead the Arizona State University football program, Herman "Herm" Edwards will be the keynote speaker at the ICON Expo Featured Speaker Brunch, February 9 at 9:00 a.m. Edwards’ experience as an ESPN analyst and New York Jets coach will motivate and energize the audience about building relationships and striving for goals. “His ideas on how to establish a vision and the steps to execute it will be motivating for all those participating in ICON Expo,” notes NCMA Tradeshow Committee Chair Pat Dubbert (Midwest Products Group). • Persimmon Plc, Doncaster, U.K., Rekers (NA) Inc.
Masonry System Selling Conference. MaSS will run February 8-10, alongside ICON Expo, and is billed as a premier event designed to bring together experienced masonry sales personnel and region promotional executives and furnish essential tools to promote and sell concrete masonry as a system. A combination of inspirational general sessions featuring building product business analyst and strategist Mark Mitchell (www.seethewhizard.com), targeted breakouts on competing building systems and networking opportunities will foster shared marketing and promotion insights to help reframe a sales team’s strategy. Conference registration includes tradeshow participation and can be obtained at http://iconexpo.org/masscon. Knowledge Garden. ICON Expo management will host 30-minute lightning talks about industry trends and hot topics directly affecting the manufactured concrete masonry and hardscape industry. All talks will take place during Friday and Saturday show hours at the Indiana Convention Center. 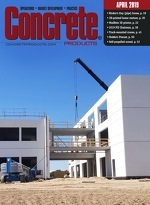 Scheduled topics include: Crystalline Silica Regulation & Compliance; OSHA Safety Regulations; Segmental Retaining Wall Best Practices – Unit Requirements; ICPI Foundation Research; Concrete Masonry Plant Certification; 2015 International Building Code & Making Masonry More Competitive; Building Information Modeling – MasonryIQ; Direct Design for Masonry Structures; Job Hazard Analysis; Construction Cost Comparison Study; Improving Freeze-Thaw Durability of Dry-Cast Concrete Products; and, NCMA Freeze-Thaw Durability Research: Wet-Cast vs. Dry-Cast.